Singers for Hire do Entertainment for Weddings. We are here to help make your wedding day a unique and amazing occasion. We understand that you have a huge range of entertainment options available to you. Therefore we want to help find the right show for you & your guests. If you have questions we are here to answer them for you. With over 25 years of experience providing entertainment for weddings in an ever changing industry we are delighted to help you. So that you can stay right on trend with the latest shows and best new surprise ideas to delight your friends and family. Our acts combine amazing singing, with an interactive, highly entertaining show. A Singers for Hire performance lifts the energy at any event and is the ultimate “Ice-Breaker” ! 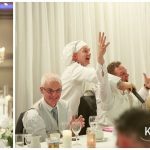 Imagine your guests’ surprise and delight when a member of staff or even one of your guests burst into song…. Our wedding waiter singers blend in with other staff until at a given point, the entertainers cause a distraction and burst into song. Performing a sophisticated and humorous show, they’ll serenade your guests, and soon everyone will be singing along to “O Sole Mio”, “Funiculi Funicula” and “That’s Amore” with their serviettes waving in the air. We have delighted hundreds of brides and grooms on four continents with our magical blend of music, comedy and surprise. From our vast repertoire, set lists are compiled to 20 to 30 minutes, featuring a variety of popular opera, swing standards, and much loved Italian, Spanish and French songs. A massive thank you to you and your team for the most amazing performance. It was a massive hit at our wedding. The singers were incredible and sang all the songs we asked for. We couldn’t have asked for anything more. 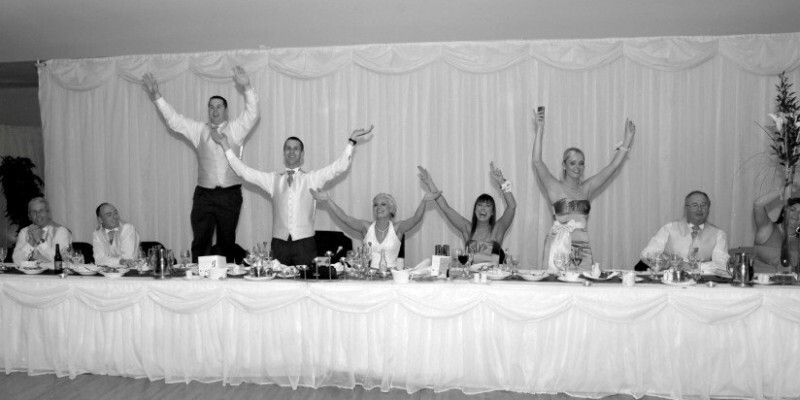 It was incredible, everybody was up on their feet, and the top table was even on top of the chairs. It was brilliant. Thank you so much again and would recommend you and your team to all brides and grooms out there. Hi riah & nyle, so sorry for not getting in touch sooner with the honeymoon and christmas it was all go after the wedding but myself and niall just want to thank you both and the singing waiter for the fantastic entertainment he gave us on our wedding night, our guests genuinely thought he was the chef coming out to see was the food ok, he had everyone fooled and then broke out his incredible voice family and friends are still talking about him, thank you again so much we will be recommending him to everyone.